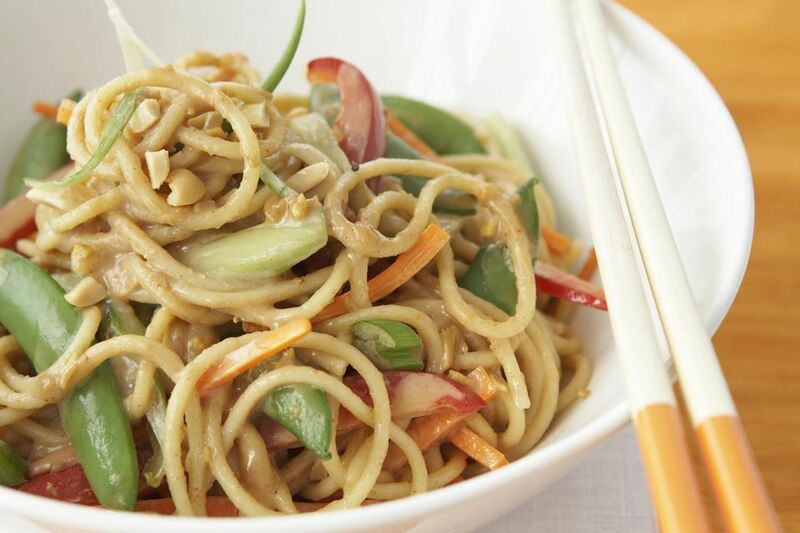 Hakka Noodles are topped with a flavorful dressing and served with a peanut and vegetable garnish. This recipe was submitted by Hirnakshi Joshi. Boil noodles in large pot of unsalted water over medium heat until barely tender and still firm. Drain immediately and rinse with cold water until cold. Drain well and toss noodles with (2 Tbsp) dark sesame oil so they don't stick together. For dressing, combine all ingredients except hot water in a blender or food processor fitted with steel blade and blend until smooth. Thin with hot water to consistency of whipping cream. Just before serving, toss noodles with sauce. Garnish with cucumber, peanuts, green onion, and carrot.